Sly Stallone's upcoming film "The Expendables" has just landed another star to add to its already heavyweight cast. Variety reports Mickey Rourke, hot off his resurrection from "The Wrestler" will play a arms dealer that helps the group of mercenaries who are trying to take down a South American dictator. Rourke joins Jet Li, Jason Statham, Dolph Lundgren, Randy Couture, Forest Whitaker, Robert Knepper, Juliana Paes, and heavily rumored Sir Ben Kingsley. The film will begin shooting in March on location in Brazil. This is the second time Stallone has used Rourke in one of his films, who also starred in "Get Carter." 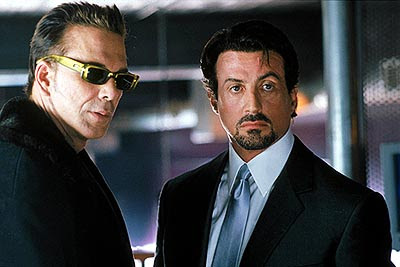 Stallone wrote the script and will also direct along with act in the action film. Avi Lerner, John Tompson and Kevin King Templeton are producing, with Boaz Davidson, Trevor Short and Danny Dimbort exec producers.